One of the most important things that needed all the time, while creating a twitter account is followers. If we have a blog or website the twitter has a major role to drive traffic to the blog or website. A tweet with your blog URL can bring viral traffic. 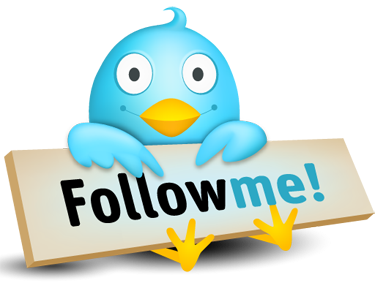 Here I would like to give some tips to get more followers on twitter. Give the exact name of the blog or your own name to your twitter account. This can help your readers to easily remember your twitter account. That will make others to follow you. It is also advised to give a proper description on your account with your blog URL. If you follow others, more likely they’ll follow you. Don’t stop there, however. Follow up with an email to each of those people letting them know why you really hope that they’ll follow you on Twitter. This follow-through increases the number of followers that you’ll get. Add your Twitter information to your email signature. Every time when you email anyone, they’ll see your twitter id and this will increase the chance to increase your follow up. Add the Twitter widget to your blog. In addition to mentioning your Twitter use yourself, you can actually show others what you’re Twittering by adding the Twitter widget to your site or blog. This encourages readers to check out your activities on Twitter and to follow you. Your bio is the only place you have to tell people who you are. Also, your bio is displayed on Twitter’s Suggested Users page. Leaving it blank or non-descriptive doesn’t encourage people to add you. Since the visual impact of your Twitter background is the strongest tool you have available. You can make your own image on your computer and upload it under Settings – Design – Change Background Image. The first 200-250 pixels width on the left hand side is a great place to put additional profile information and list websites. Create a “Twitter landing page” instead of sending users to the front page of your website. Advertisers create custom landing pages for different markets, so why not treat your Twitter audience differently, too? You can create one that explains to potential followers how you use Twitter and how to interact with you. Give an attractive profile picture to your account. Keeping your profile pictures consistent across all your social networks will help people find you and recognize you online as well as offline. A picture of you with a hat obstructing your face or you in your Halloween costume should probably be swapped out for a picture that looks like you almost all of the time. Put links to your Twitter profile everywhere. Link it on your Digg, LinkedIn, Facebook, and everywhere else you live online. And share your tweets with this entire social networking website that will give more visitors to your twitter account. Make an announcement on your other social networking sites that you’d like to be followed on Twitter. Let your Facebook and MySpace friends know where they can find you to follow you on Twitter. Don’t just make this announcement once either; update your Facebook status with this info every two or three weeks to keep getting people’s attention back to your Twitter. You can also post to Facebook from Twitter by connecting both the account. Thus your tweet can get more exposure on Facebook and this will lead to increase in traffic and follow up. Make some tweets regularly in your twitter account. The best way to get followers is to respond regularly to the things that others post. More active you are on Twitter, more likely people will follow you. There are many online groups like Socialmedclub.com by which you can get more retweets and follow up. The key strategy is to give before you expect any return. Follow and retweet other people and get more people to follow you back. Offer guest posts on the sites of big Twitter users. Find Twitter users who have a lot of followers and check out their blogs and offer your guest posts. They’ll promote their post on twitter, in addition to the traffic this will also lead to increase your twitter follow ups. Mention regularly in your blog or on your website that you are a Twitter user and be sure to link to your Twitter contact information. You can also mention your twitter account often inside your posts. Twitter Counter will show you how many new users you’re adding per day and it will email you when someone unfollows you after a tweet. This can help to identify what your followers are expecting from you. Every time I give a talk, speak on a panel, shoot a podcast, present slides, or hand out business cards, I figure out a way to broadcast or display my twitter account. Add your Twitter URL to your business cards. Make sure all printed promotional materials that you have include a link to your Twitter profile. Make your twitter account as a verified account. If your account is a verified account then you will get more followers. Akhil Abraham is founder of Glob Info Tech and he is crazy about Twitter. Read his article 100 ways to drive traffic to your blog.